Health bosses in Nottinghamshire have issued a warning after a laptop containing information on about 11,000 young children was stolen. 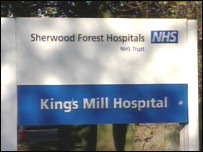 The laptop was one of three taken from an office at King's Mill Hospital in Sutton-in-Ashfield on 21 March. It contained the names, addresses and dates of birth of children from the Newark, Mansfield and Ashfield areas. Nottinghamshire Primary Care Trust (PCT) said the matter was being taken "extremely seriously". The information on the computer concerned children aged eight months to eight-years-old. Dr Amanda Sullivan, from the Nottinghamshire County PCT, said: "We have certainly taken this extremely seriously and immediately set up an inquiry. "We are also working closely with the police, who have taken it equally seriously in view of the fact that confidential information was contained on the computer." The trust has written to all families affected by the theft. Wendy Saviour, the PCT's chief executive apologised for any problems caused by the incident. "We would like to reassure the public that this matter is being fully investigated and we are taking every step to prevent this happening again. "We are very sorry for any difficulties that this may cause and greatly regret that this theft has happened." She said the information on the device is protected by a password. A helpline has been set up to support families. A Nottinghamshire Police spokesperson said the force were aware of the incident and were investigating the burglary.